Originally built as a luxury hotel built between 1869 and 1870, the Pico House has the distinction of being L.A.’s first three-story building. Though it's no longer a hotel, the stately structure still stands today and is part of the El Pueblo de Los Angeles State Historic Monument. 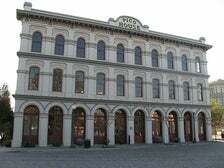 Commissioned by Pio Pico, a former governor of Alta California, and designed by Ezra F. Kysor, the Italianate-style building was considered one of the city’s finest lodgings during its early years and boasted an aviary, courtyard, 21 ballrooms, bathrooms for both sexes on each floor, and a French eatery. The versatile building features four distinct façades - as such, it has been a favorite of location scouts over the years. In the Season 5 finale of The Next Generation titled “Time’s Arrow: Part 1,” the historic property and its surroundings masqueraded as 19th century San Francisco. 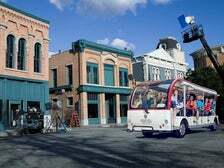 (For “Time’s Arrow: Part 2,” the newly completed New York Street backlot set at Paramount Studios represented S.F.) 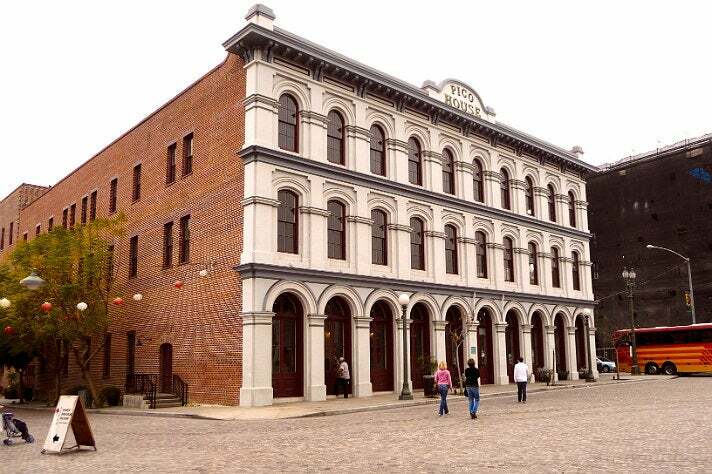 The Pico House’s brick-clad rear edifice regularly served as the “Sacramento” CBI Headquarters on The Mentalist. That same side of the structure was utilized as a Mexican police station in the Season 1 episode of Criminal Minds titled “Machismo,” while the building’s west end stood in for the “San Francisco” apartment where Sam (Pam Dawber) and Patti (Rebecca Schaeffer) live on My Sister Sam. The site also appeared in JLS’ “Everybody in Love” music video, as well as an episode of Ghost Hunters. The neighboring Olvera Street, aka the birthplace of Los Angeles, is a bustling open-air marketplace and popular tourist attraction featuring shops, historic buildings and restaurants. The picturesque piazza is also a popular screen star, having appeared in such productions as Lethal Weapon 3, 90210 and the 1921 Charlie Chaplin classic, The Kid. One of L.A.’s most recognizable buildings and certainly one of its most popular filming locations, the Griffith Observatory is perched 1,134 feet above sea level in Griffith Park. The three-domed structure was originally designed in 1935 by architects Frederick M. Ashley and John C. Austin and boasts a plethora of attractions, including a Foucault pendulum, a Zeiss refracting telescope, a triple beam solar telescope, a Tesla coil, and a planetarium. The handsome site has appeared in countless productions over the years, including Rebel Without a Cause, Beverly Hills, 90210, The Terminator, and The Wonder Years. In the Season 3 episode of Voyager titled “Future’s End: Part 1,” astronomer Rain Robinson (Sarah Silverman) works at the observatory, which plays itself. The locale also boasts another Star Trek connection. 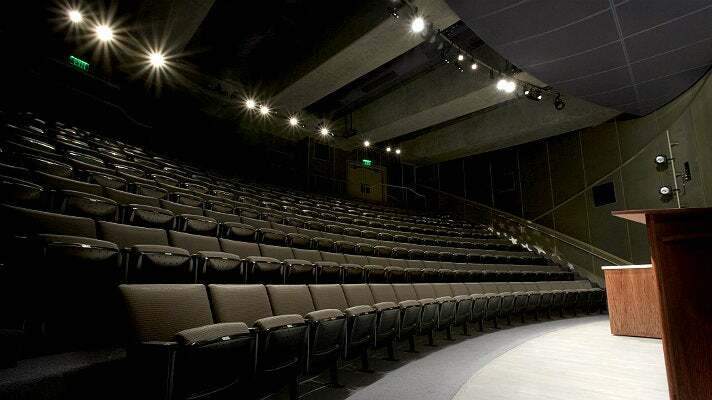 The Leonard Nimoy Event Horizon, a 190-seat presentation theatre that was largely funded by the late actor and his wife, Susan Bay-Nimoy, was added to the site in 2006. 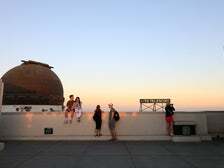 The space features regular showings of The Once and Future Griffith Observatory, a 24-minute film narrated by Nimoy. It also hosts live performances and demonstrations and serves as a classroom. The Griffith Observatory, which welcomes more than 2 million visitors each year, is open Tuesday through Sunday. Admission to the building and its surrounding grounds, which offer stunning views of L.A., is free and no reservations are required. Tickets to the various planetarium performances can be purchased onsite. 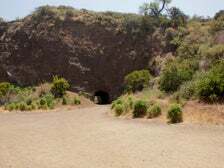 A short pathway at the western edge of Griffith Park leads from a public parking area to a series of caves that was featured on Star Trek a copious number of times. 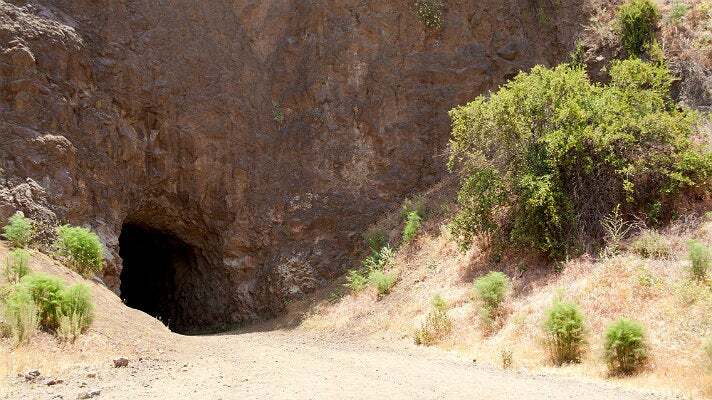 Known as Bronson Canyon, or Bronson Caves, the site is the remnant of a former 1903 rock quarry that was established to provide pavement for Los Angeles city streets. When the facility was shuttered in the 1920s, several small caves were left behind. The rocky caverns and craggy surrounding canyon have provided Hollywood with a versatile landscape ever since. The area proved especially fruitful for the Star Trek franchise, masking as several locales including the Rura Penthe mines in Star Trek VI: The Undiscovered Country, a Delta Quadrant planet on Voyager, and both a Bajoran settlement and the planet Kesprytt III on The Next Generation. Though seemingly desolate and remote, Bronson Canyon can be reached via a quick and easy walk that measures less than 2/3 of a mile round-trip. The caves are open daily from 5 a.m. to 7 p.m. 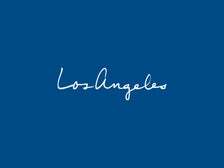 Though striking in and of themselves, they also boast a fabulous view of the Hollywood Sign. The wooded retreat has also appeared in plenty of non-Star Trek-related productions, including the 2012 comedy Ruby Sparks and the Season 2 episode of Castle titled “A Deadly Game.” Ferndell is open to the public from 6 a.m. to 10 p.m. daily. Don’t miss Trails Café, an outdoor eatery located just outside of Ferndell’s north entrance, which serves espresso drinks and teas, as well as a sumptuous selection of homemade pastries, sandwiches and quiches. Both the unaired and aired pilot of The Original Series - titled “The Cage” and “Where No Man Has Gone Before,” respectively - were shot at Desilu Studios (now The Culver Studios) in Culver City. Once the show was picked up, filming moved to Desilu-Gower, which was acquired by Paramount Pictures in 1967 and today is part of The Studios at Paramount. Stages 31 and 32 were utilized for most interior filming during TOS' three-year run. 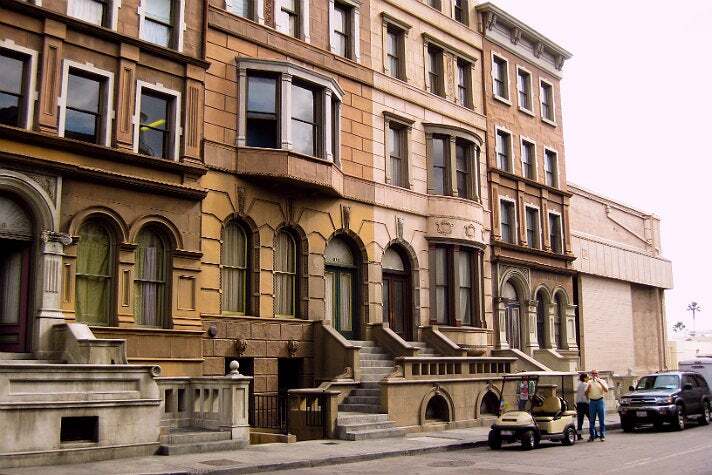 Several other areas of the lot also made appearances on the show, including the Schulberg Building, which masked as Ekosian headquarters in the Season 2 episode “Patterns of Force.” Other productions in the franchise, including The Next Generation, Deep Space Nine, Voyager and Enterprise, also made use of Paramount and its backlot, specifically the vast five-acre New York Street, which boasts eight different cityscapes representing areas of the Big Apple such as SoHo, the Upper East Side, and Washington Square. Originally established in 1926, The Studios at Paramount is the oldest major studio still located in Hollywood. The site offers three different tours that range from 2 to 4 hours in length, during which visitors are invited to walk through the historic backlot, venture onto working soundstages, visit various production facilities, and catch a true glimpse of Hollywood in action. Tours are given daily, including weekends. Advance reservations are recommended. 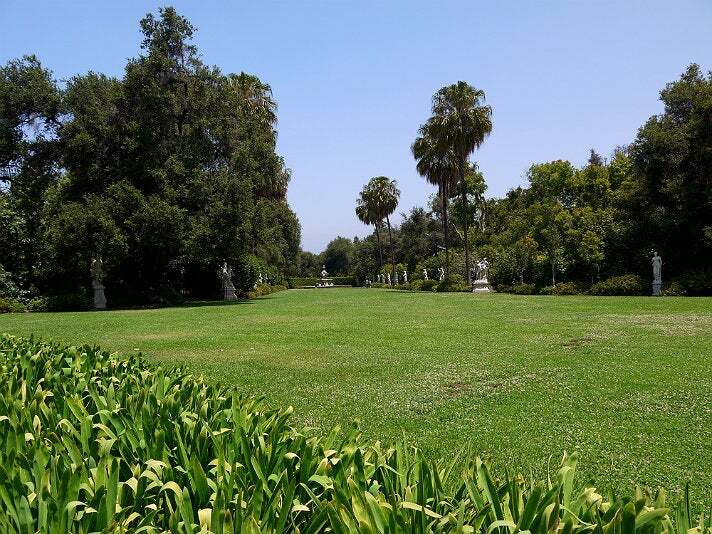 The Huntington Library, Art Collection and Botanical Gardens is the former estate of railroad tycoon Henry Huntington and is one of L.A.’s best-loved attractions and most popular filming locations. The gorgeous 207-acre site consists of a world-class art collection with works by Thomas Gainsborough, Edward Hopper and Rembrandt; a sprawling expanse of immaculately landscaped grounds divided into Japanese, Chinese, rose, and Zen gardens; and a library containing more than 375,000 rare books, including a Gutenberg Bible and a first folio edition of William Shakespeare’s collected plays. The Huntington has popped up in several Star Trek productions. The Lily Ponds Lawn masked as the grassy stretch of the planet Edo where Wesley Crusher (Wil Wheaton) was almost killed for “disturbing new plants” in the Season 1 episode of TNG titled “Justice.” Commander Riker (Jonathan Frakes) and Counselor Troi (Marina Sirtis) also picnicked on that lawn in the Season 3 episode titled "Ménage à Troi." The Huntington was also featured in the Deep Space Nine episodes “Emissary” and “Meridian." 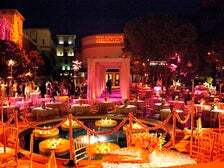 The picturesque property has also appeared in such hits as Bridesmaids, A Cinderella Story, Iron Man 2, Indecent Proposal, First Daughter and Charlie’s Angels. The 160-acre Descanso Gardens was originally developed in 1936 by Los Angeles Illustrated Daily News publisher Elias Manchester Boddy, whose numerous interests included horticulture and politics. The following year, he commissioned architect James E. Dolena to build a 12,000-square-foot Hollywood Regency-style residence on the property, where Boddy would live with his wife and two sons for over a decade. 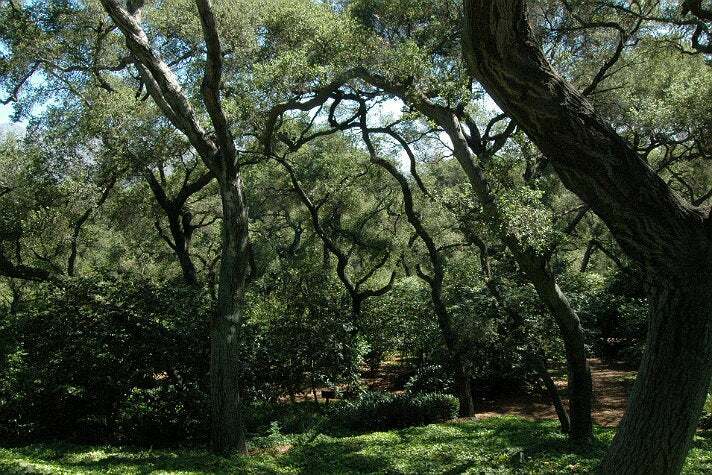 Upon retiring in 1952, he put his Rancho del Descanso up for sale - it was eventually purchased by the County of Los Angeles and turned into a public space. 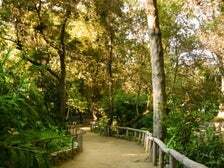 Today, it is a favorite destination for Angelenos and visitors alike, and features countless areas for exploring, including a bird sanctuary, a five-acre rosarium, a Japanese tea garden, a water-wise garden, an Oak Woodland, a California garden, and the world’s largest collection of camellia flowers. Descanso Gardens' sprawling twenty-acre Oak Forest masqueraded as Sherwood Forest in the Season 4 episode of TNG titled “Qpid.” Descanso, which means "rest" or "repose" in Spanish, also played the role of the wooded Gamma Quadrant planet in the Deep Space Nine Season 2 episode titled “The Jem’Hadar.” The idyllic site has also popped up in Daredevil, Minority Report, America’s Sweethearts, Legally Blonde and Mad Men. Both the interior and the exterior of the Boddy House, which can be toured while visiting the gardens, were used extensively as Jon Voight's residence in the 2008 holiday comedy Four Christmases. 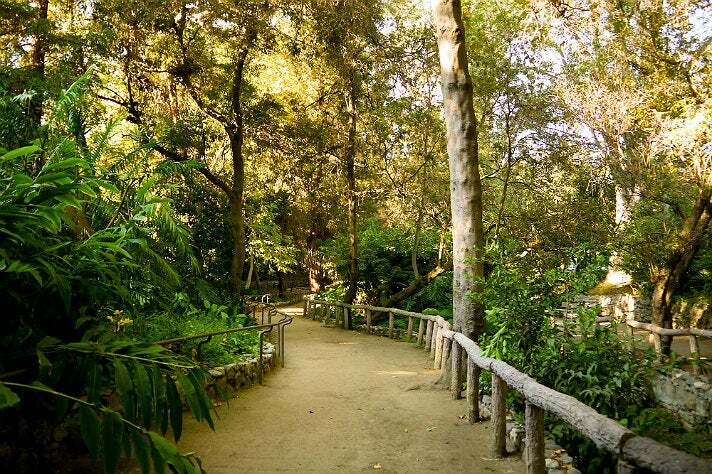 Descanso Gardens is open from 9 a.m. to 5 p.m. every day of the year, except for Christmas. Tickets can be purchased onsite. Though the vast majority of the Star Trek franchise’s backlot filming took place at The Studios at Paramount, a Voyager episode was lensed at another of L.A.’s premier studios, Warner Bros. For Season 7’s “Flesh and Blood,” the cast and crew made the trek out to Burbank to shoot scenes at Warner Bros.’ famous Jungle, which masked as a wooded Hirogen holodeck training simulation. The lush outdoor Jungle set consists of a 10,000-square-foot lagoon surrounded by a plethora of foliage, as well as several rural structures including a cabin, a barn, and a roadhouse. The expansive space, which was originally constructed for the filming of the 1955 movie Santiago, is extremely versatile and has played the role of everything from an apple farm on Pretty Little Liars to a biker bar on The Mentalist. It has also appeared in Hart of Dixie, Million Dollar Baby, True Blood and The Last Samurai. The Jungle can be viewed as part of the Warner Bros. Studio Tour Hollywood, a two-hour guided visit to the sprawling 110-acre lot in which guests explore countless backlot sets, journey through soundstages, and experience a hands-on view of the inner-workings of Hollywood. The historic studio, which was founded by brothers Jack, Harry, Albert and Sam in 1923, also offers a five-hour Deluxe Tour, which provides a more in-depth look at the celebrated property. Tours are given daily, including weekends, and advance tickets are recommended, especially during the summer months. 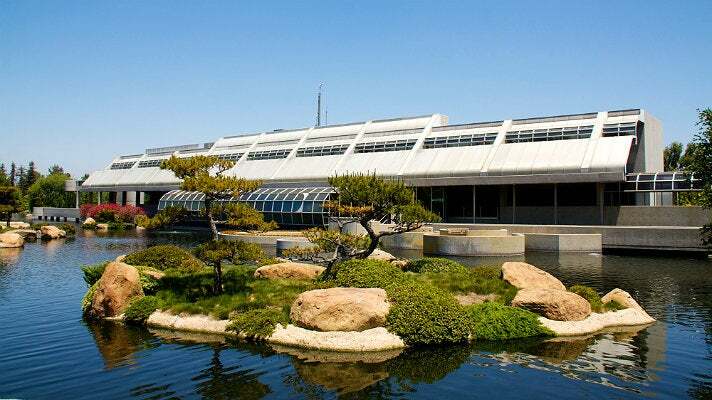 A highly unique wastewater treatment facility in Van Nuys known as the Donald C. Tillman Water Reclamation Plant & Japanese Garden regularly masked as Starfleet Academy and Starfleet Command in numerous Star Trek productions, including The Next Generation, Deep Space Nine, Voyager, and Enterprise. 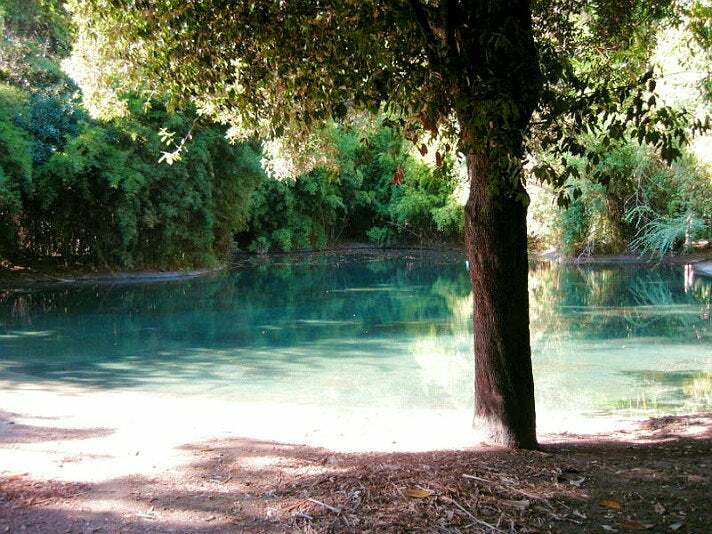 The site was originally established in 1984 in order to purify wastewater for re-use. Though a seemingly unlikely tourist attraction, the 90-acre property also boasts a stunning 6.5-acre Japanese garden known as SuihoEn, which welcomes over 1,000 visitors each month. The scenic locale was designed by Doctor Koichi Kawana to demonstrate one of the many possible uses of reclaimed water and features a teahouse, waterfalls, streams, a Zen garden, a Chisen garden, and a tea garden. The plant’s concrete postmodern administration building, designed by Anthony J. Lumsden, stands as a sharp, but picturesque contrast to the serene grounds. It is this building that was regularly featured as Starfleet Academy and Starfleet Command. Though CGI and matte paintings were typically employed to make the structure appear taller and to add the Golden Gate Bridge into its background, it is still quite recognizable from its countless Star Trek appearances. 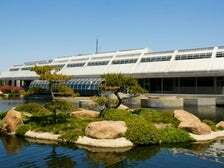 The Donald C. Tillman Water Reclamation Plant also masked as the home planet of the Edo in the Season 1 episode of The Next Generation titled “Justice.” The property is open Sunday through Thursday and admission is $5 per person. Bonus – the 2013 film Star Trek Into Darkness utilized another of L.A.’s most handsome sites, the Getty Center, to represent Starfleet Headquarters. One the franchise’s most oft-used locales, the 932-acre Vasquez Rocks Natural Area Park masqueraded as everything from the mysterious mind-reading planet on The Original Series to a moon on Voyager to Mintaka III on The Next Generation to planet Vulcan in both Star Trek IV: The Voyage Home and the 2009 J.J. Abrams-directed Star Trek. Located in the Sierra Pelona Mountains, the otherworldly site, which consists of 150-foot-tall jagged rock formations that jut from the earth at 50-degree angles, was named for Tiburcio Vasquez, an infamous outlaw who pillaged up and down the coast of California during the 1800s and used the rocks as a regular hideout from authorities. The park is one of L.A. County’s most picturesque spots and has become extremely popular with location scouts, playing host to more than 200 shoots each year. 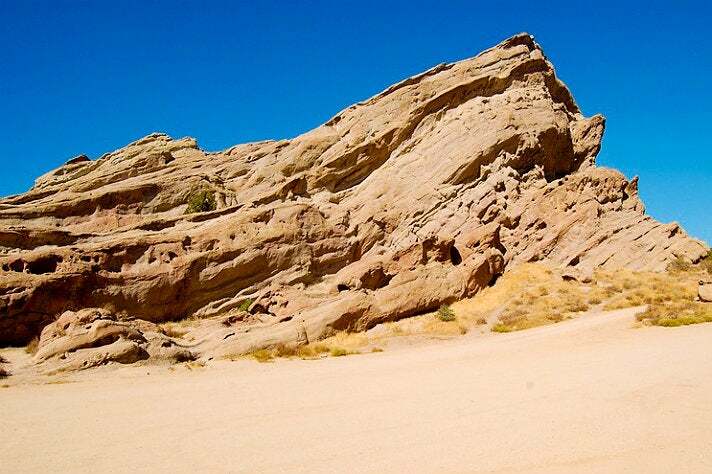 Arguably, Vasquez Rocks’ most memorable Star Trek appearance was as the barren planet where Captain Kirk (William Shatner) famously battles a Gorn in TOS’ Season 1 episode, "Arena." The 2001 comedy Jay and Silent Bob Strike Back paid homage to that episode by setting a scene at the park, complete with a fake café named “Arena Diner” that was installed onsite for the shoot. 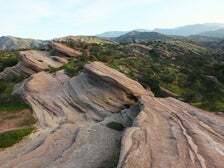 Vasquez Rocks is open daily from 8 a.m. to 7 p.m. and is easily accessible with plenty of parking. The site offers hiking (ranging from easy to difficult), photo-taking opportunities, and fabulous views. The area’s striking rocks are also visible from Escondido Canyon Road and the Antelope Valley Freeway, and were depicted in a driving scene in the 2006 comedy Little Miss Sunshine.